Congress held the first hearing on the Equality Act. Republicans made it all about trans people. The House Judiciary Committee held the first hearing ever on the Equality Act, and the Republican strategy against the bill was to focus on transgender people in sports while ignoring the vast majority of the bill. The Equality Act would add sexual orientation and gender identity to the Civil Rights Act of 1964, banning discrimination against LGBTQ people in employment, housing, public accommodations, and several other areas. Representative Jerrold Nadler (D-NY), who is also the chair of the committee, called the hearing. “Nearly 50 years after the Stonewall Uprising, there is still no federal law that explicitly prohibits millions of lesbian, gay, bisexual, or transgender Americans from being denied medical care, fired from their jobs, or thrown out of their homes simply because of who they are,” Nadler said in his opening remarks. Most of the witnesses supported the Equality Act. “Having gone through what I went through in the segregated South has sensitized me towards discrimination against anybody,” said Dennis Wiley, pastor of the Covenant Baptist United Church of Christ. Jami Contreras testified about her personal experience with discrimination. Last year, a doctor refused to treat Contreras’s daughter because her mothers are lesbians. Of the eight witnesses, only two spoke against the Equality Act. Julia Beck, a lesbian Trans-Exclusionary Radical Feminist (TERF) who has spoken at the far-right Heritage Foundation and on Fox News’s Tucker Carlson Tonight, said that she opposes including gender identity in the Equality Act. Beck thanked the Republicans on the committee for inviting her to the hearing. Duke Law School professor Doriane Lambelet Coleman said that she was only concerned with transgender women crowding cisgender women out of sports. Several of the Republican representatives who asked questions and commented on the Equality Act also focused entirely on the myth that transgender women are really just men who want access to the privileges of womanhood. Both representatives Steve Chabot (R-OH) and Doug Collins (R-GA) brought up “rapid onset gender dysphoria” and a discredited survey of parents of transgender children by Lisa Littman that the Republicans said showed that transgender people lie about their gender identities. Representative Louie Gohmert (R-TX), who has compared gay people to Nazis on the House floor, implied that his Democratic colleagues were naive to believe transgender people are honest about their gender identities. Representative Hakeem Jeffries (D-NY) noted that it was odd that the Republicans were so concerned about unfairness toward cisgender women when they have been voting against legislation for women for years, including the Violence Against Women Act and the Paycheck Fairness Act. 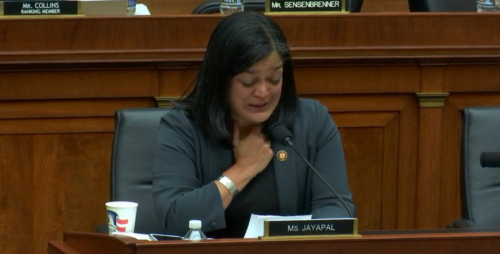 Democratic Rep. Primila Jayapal’s emotional speech about her own “gender non-conforming child” brought the room to tears. “My beautiful, now-22 year old child told me last year that they were gender non-conforming. And over the last year, I have come to understand from a deeply personal mother’s perspective,” she said. “I came to understand what their newfound freedom—it is the only way I can describe what has happened to my beautiful child — what their newfound freedom to wear a dress, to rid themselves of some conformist stereotype of who they are, to be able to express who they are at their real core.